Cargo volumes range between 12.6 and 78.7 cu.-ft.
Cadillac was one of the first luxury brands to embrace the SUV, adding a whole bunch of fancy to a Chevy Tahoe back in the 1990s. But the company has been comparatively slow to capitalize on the crossover SUV trend. With the introduction of the new 2020 Cadillac XT6 at the North American International Auto Show in Detroit, the company now has three crossover SUVs slotting in below the now-iconic Escalade. The XT4 is the small one. The XT5 is the midsize one. And the new XT6 is the 3-row one. Two versions of the Cadillac XT6 will be available. The XT6 Premium Luxury is aimed at customers looking for a more traditional look and feel, while the XT6 Sport is detailed for a custom look and tuned for a more engaging driving experience. For the new XT6, Cadillac lifts design cues from its Escala concept vehicle, and the overall look is modern and tailored if more conservative. Standard equipment includes 20-inch aluminum wheels, LED headlights and, naturally, this Cadillac features vertical LED lighting signatures front and rear. As an option, buyers can select projector array performance LED headlights. Bright exterior trim and red taillight lenses identify the Premium Luxury version of the XT6, while the XT6 Sport gets darker trim, a unique grille and pattern, clear taillight lenses, and a 21-inch wheel-and-tire option. Inside, the XT6 Premium Luxury has wood interior trim, while the Sport has carbon fiber décor. Each offers seating for seven people in three rows of seats, and Cadillac says the second-row seats are designed to maximize access to the third-row seat with a tip, pitch, and slide function. By cargo volume standards, the Cadillac XT6 is a midsize SUV. With all three rows in use, there is just 12.6 cu.-ft. of space for cargo. Use the standard power-folding third-row seat feature to expand the space, and you’ll have a generous 43.1 cu.-ft. cargo bay. Use the remote second-row fold-down function and maximum volume measures 78.7 cu.-ft. These numbers leave plenty of incentive to upgrade to an Escalade. 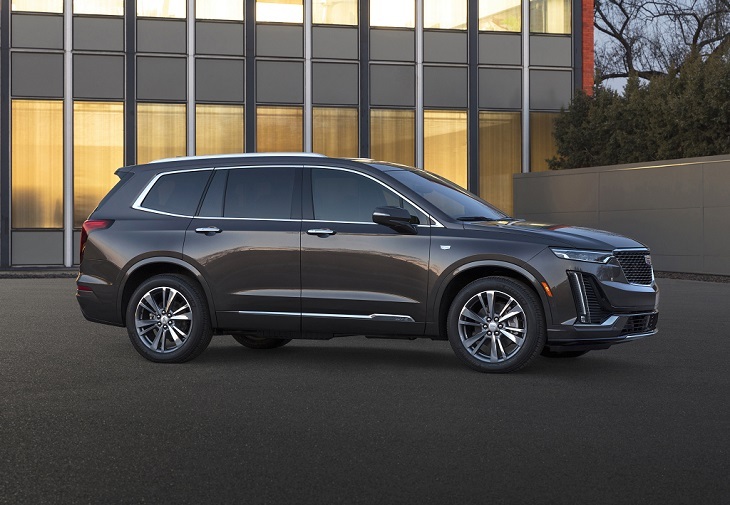 Among the announced cabin upgrades for the XT6, Cadillac has confirmed that you can get premium semi-aniline leather, a cabin air ionizer, automatic heated and ventilated front seats, heated second-row seats, and an automatic heated steering wheel for this new SUV. A hands-free liftgate is also available, complete with an illuminated rear Cadillac crest. A tried-and-true 3.6-liter V6 engine powers the Cadillac XT6, making 310 horsepower and 271 lb.-ft. of torque. An Active Fuel Management system allows the engine to operate on just four cylinders under appropriate conditions. Power flows to the Premium Luxury model’s front wheels through a 9-speed automatic transmission. All-wheel drive is an option for the Premium Luxury and is standard for Sport. The version in the Sport is an active twin-clutch system that includes active yaw control. Maximum towing capacity is up 4,000 pounds, and the XT6 offers up to 6.7 inches of ground clearance. Again, Cadillac leaves SUV buyers plenty of reason to upgrade to an Escalade, which can tow more weight and clear more ground. The XT6 Luxury Premium is tuned to provide a smoother ride and support a more relaxed driving style. The XT6 Sport intends to deliver greater handling agility through a standard adaptive damping suspension and faster steering response combined with greater road feel. Driving modes are calibrated specifically for each version of the XT6. Teen Driver is a system that monitors use of the vehicle and then delivers a “report card” to the owner that defines how, where, and when the XT6 was used while it was away from home. Every XT6 is equipped with the latest version of the automaker’s Cadillac User Experience (CUE) infotainment system, which includes an 8-inch high-definition display, a rotary controller, and a new “jog” function that allows the controller to work like a joystick to navigate menu items. Apple CarPlay, Android Auto, and a 4G LTE Wi-Fi hotspot with a 3-month/3GB trial period are also standard, and the system is prepped to support new SiriusXM 360L services. Cadillac equips the XT6 with six USB ports, two in each row. Available upgrades include one-touch Near Field Communication phone pairing and next-generation 15-watt wireless charging. The optional navigation system features new natural address entry capability, and a new 14-speaker Bose Performance Series sound system with custom-tuned speakers is available. Additional technology offerings include cloud-based interior personalization settings that transfer to other GM vehicles, adaptive remote engine starting, a head-up display, automatic parking assist with braking, and a rear camera mirror with a remote washer. A surround vision camera recorder is also available.